William M. Thomson writes of the pesky sparrows in Syria. No traveler in Syria will need an introduction to the sparrow on the house-top. They are a tame, troublesome, vivacious, and impertinent generation, and nestle just where they are not wanted. They stop up the stoves-pipes and water-gutters with their rubbish, build nests in the windows and under the beams in the roof, and would stuff your hat full of stubble if they found it hanging in a place to suit them. They are extremely pertinacious in asserting their right of possession, and have not the least reverence for any place or thing. David alludes to these characteristics of the sparrow in the eighty-fourth Psalm, when he complains that they had appropriated even the altars of God for their nests [Psalm 84:3]. Concerning himself, he says, “I watch, and am as a sparrow alone upon the house-top” [Psalm 102:7]. When one of them has lost its mate—a matter of every-day occurrence—he will sit on the house-top alone, and lament by the hour his sad bereavement. As these birds are not much relished for food, five sparrows may still be sold for “two farthings;” and when we see the eagerness with which they are destroyed as a worthless nuisance, we can appreciate the assurance that our heavenly Father, who takes care of them, so that not one can fall to the ground without his notice, will surely take care of us, who “are of more value than many sparrows.” [Matthew 10:29, 31; Luke 12:6-7] (Thomson, William M. The Land and the Book. New York: Harper & Brothers, 1886. Vol. 2, p.59. The photo below shows one of the many varieties of sparrows found in the Middle East. 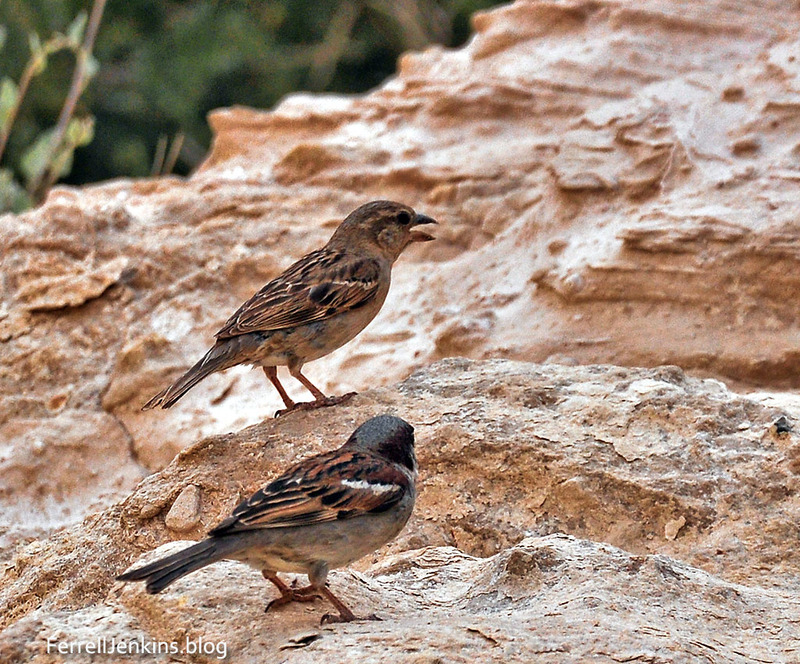 Two sparrows at Ein Avedat in the Negev of Israel. Photo by Ferrell Jenkins. The first verse mentioned by Thomson illustrates the nuisance of the sparrow, making a nest even at the altars of the LORD. The next speaks of the lonely sparrow. The last reference speaks of the custom of buying sparrows. The IVP Bible Background Commentary: New Testament (Keener, Craig S.) explains this custom. Sparrows were one of the cheapest items sold for poor people’s food in the marketplace, the cheapest of all birds. Two were here purchased for an assarion, a small copper coin of little value (less than an hour’s work); Luke 12:6 seems to indicate that they were even cheaper if purchased in larger quantities. This is a standard Jewish “how much more” argument: If God cares for something as cheap as sparrows, how much more does he care for people! The Lord’s use of simple examples from nature and everyday life to illustrate great truths provides an example for all who teach. 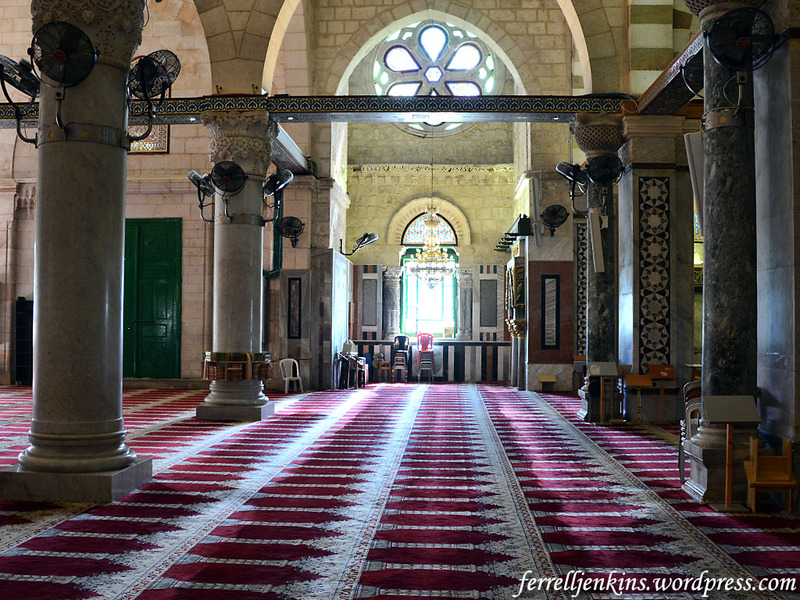 The entire Temple Precinct is called the Haram es-Sharif (Noble Sanctuary) by Moslems. They claim that the site has been identified with Islam since the religion’s beginning. 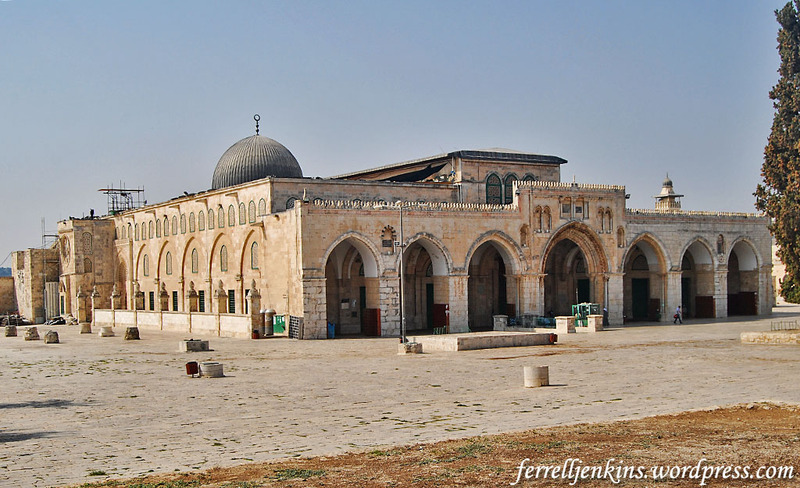 The Al-Aksa (also El-Aqsa or el-Aksa) mosque is especially important because it is to this place that the Prophet Mohammad came on his night journey. Our first photo shows the exterior of the mosque. 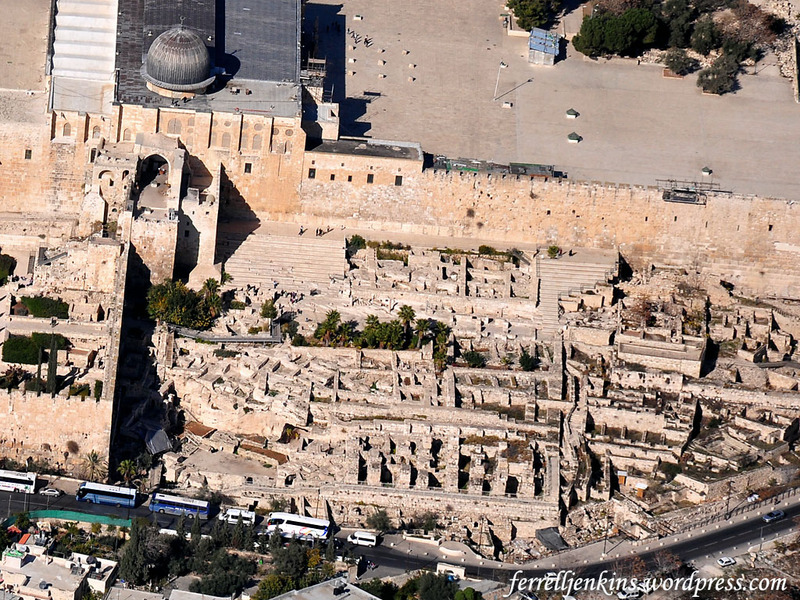 Instead of being built on bedrock like the Dome of the Rock, this building sits on the substructure built by Herod the Great beginning in about 20 B.C. The Royal Stoa of Herod’s temple ran across the southern section of the platform at that time. Exterior view of the Al-Aksa mosque. The dome of this building is plated with lead. Photo by Ferrell Jenkins. Murphy-O’Connor describes the impression when one first enters the building. Al-Aksa has seven aisles running north-south. This is the central aisle with a view to the south. Photo by Ferrell Jenkins. 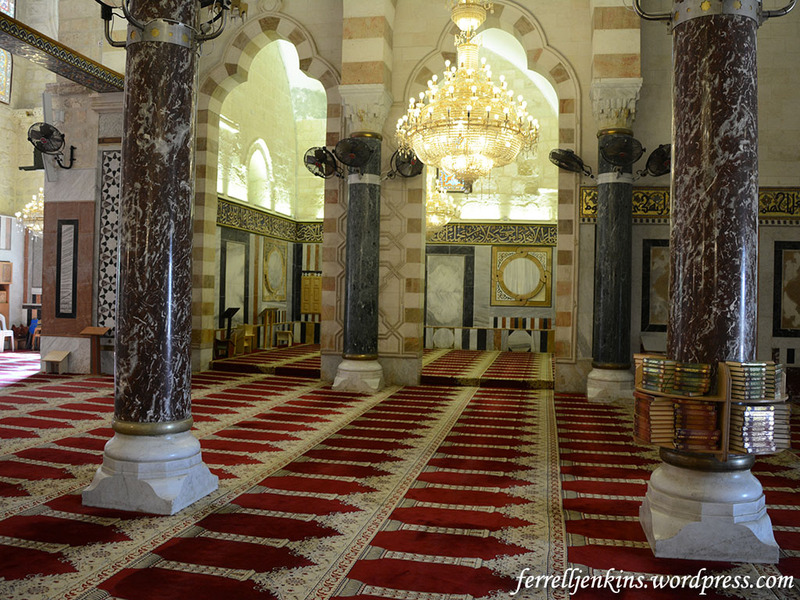 A special section of the Mosque is reserved for the Hashemite family of Jordan. Before the Six-Day war of 1967 their visits from Amman to Jerusalem must have been much more frequent. The Hashemite family claims descent from Mohammad, the name being derived from the name of the Prophet’s great-grandfather. 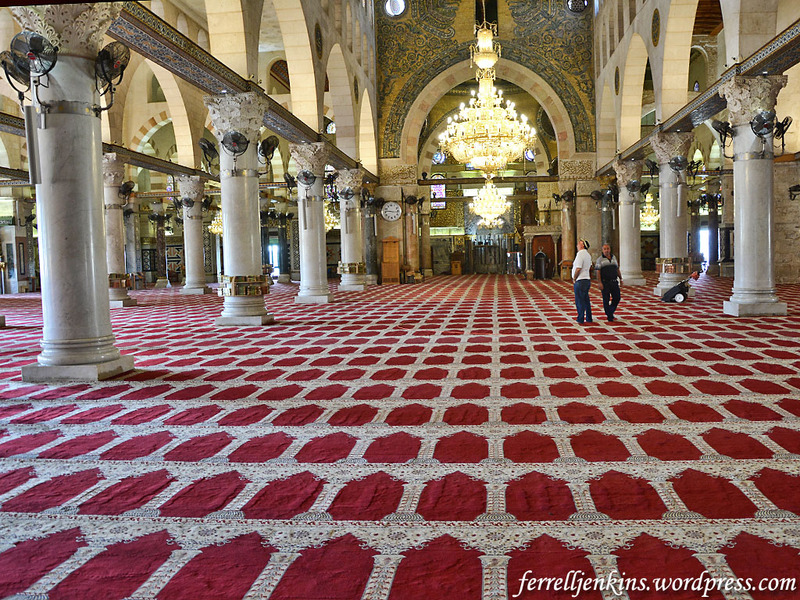 The family is guardian of the Moslem holy places in Jerusalem. This view to the east is reserved for the Hashemite family of Jordan. Photo by Ferrell Jenkins. Next, is a view looking west. This view is toward the west. Photo by Ferrell Jenkins. King Abdullah I was assassinated while entering the mosque in 1951. All of the sources I have read say this happened at the “entrance” to the mosque. 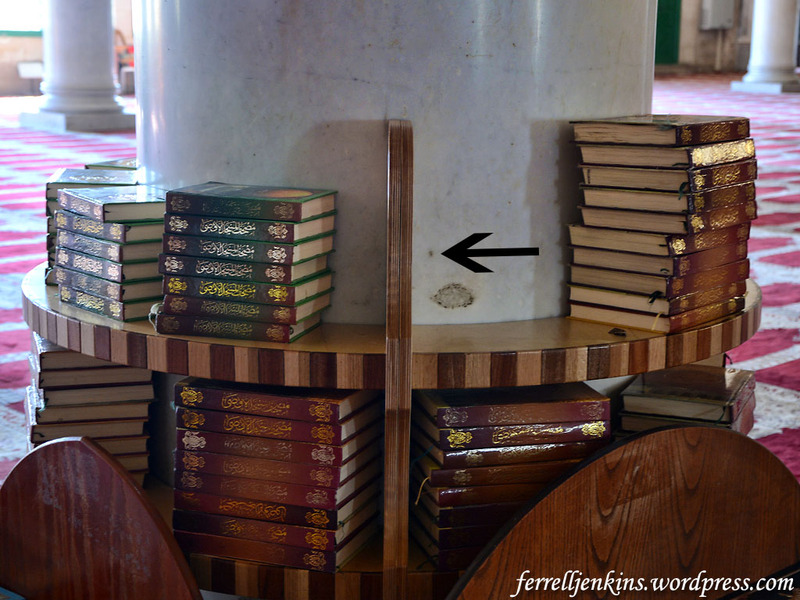 Our guide moved aside a stack of books so we could see what he claimed was where one of the bullets lodged. I have placed the arrow to indicate the spot. This column is the first row as one enters the building. I have to leave the story there. Our guide says that one of the bullets fired at King Abdullah I lodged in this column and was left here (where out arrow is pointing). Photo by Ferrell Jenkins. At the south end of the Mosque we were able to look down on the recently excavated steps that led to the Double Gate. This was one of the entrances to the Temple in the time of Jesus. View of the Temple Mount steps from inside Al-Aksa mosque. Photo by Ferrell Jenkins. The window from which our previous photo was made can be seen in the wall, level with the top of the shadow arrow. 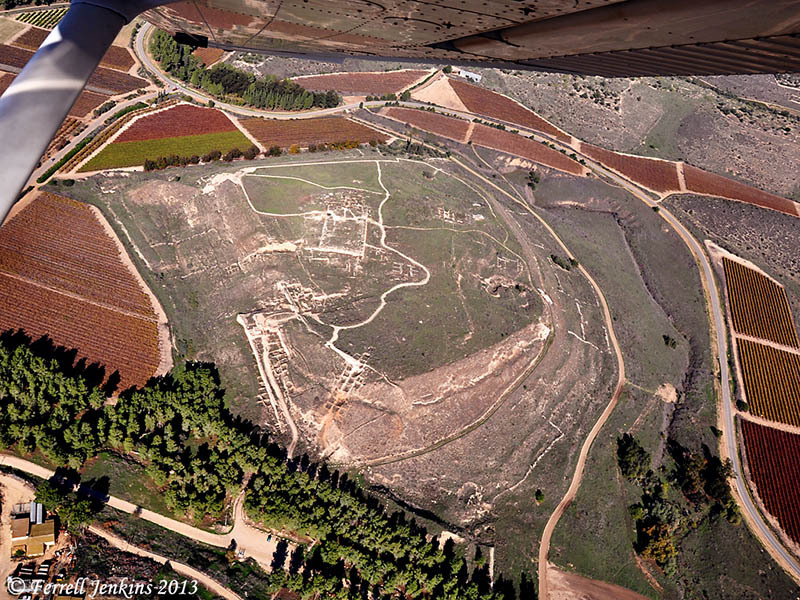 Aerial view showing the Al-Aksa dome, the Ophel, including the gigantic stairway that worshipers took to enter the temple. Photo by Ferrell Jenkins. And, here is a closer view of the stairway. In this photo the window in the south wall of the Al-Aksa Mosque is visible at the top of the photo. 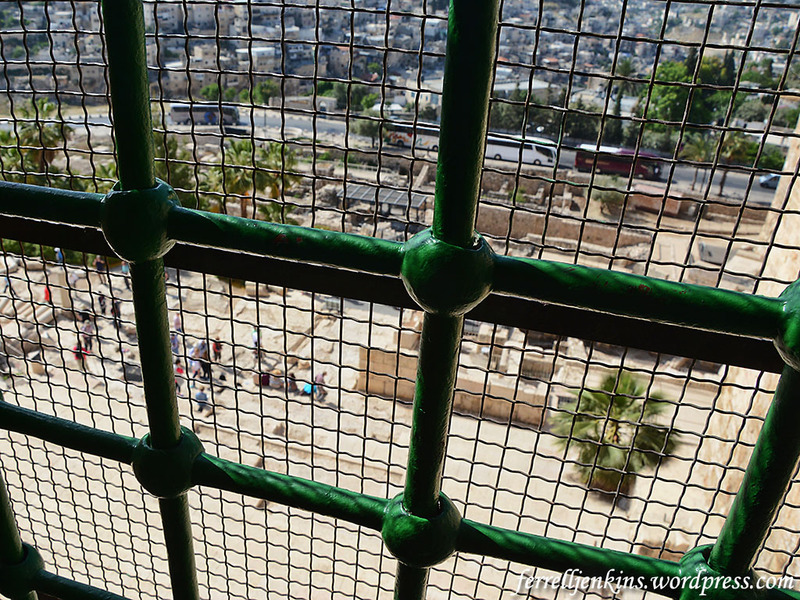 At the time of Herod’s temple, worshipers ascended the steps, then entered through the double gates, taking more steps up to the Temple Mount platform. 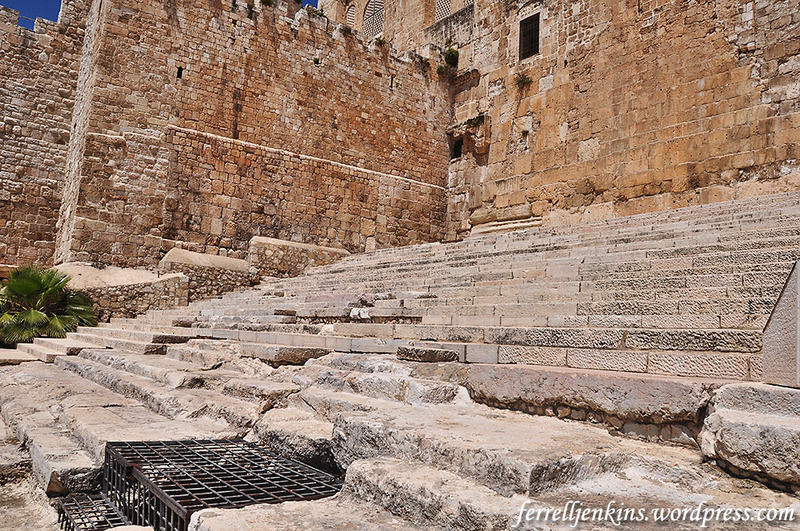 The monumental steps that led to the temple in the time of Jesus. Photo by Ferrell Jenkins. There is good reason to believe that both Jesus and the Apostles used this entry to the Temple (Matthew 21:12-13; Acts 3:1). 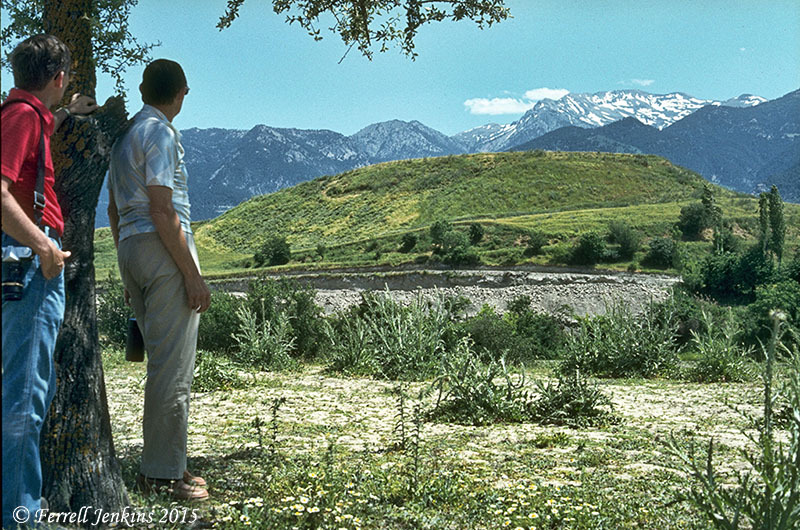 In May, 1984 I directed at tour to Israel, Egypt, and Rome. With the group ready to return from Rome to the USA, I went to Athens to meet two of my Florida College colleagues, Melvin Curry and Phil Roberts. The next day we took a flight to Samos, Greece and a ferry to Kusadasi, Turkey. 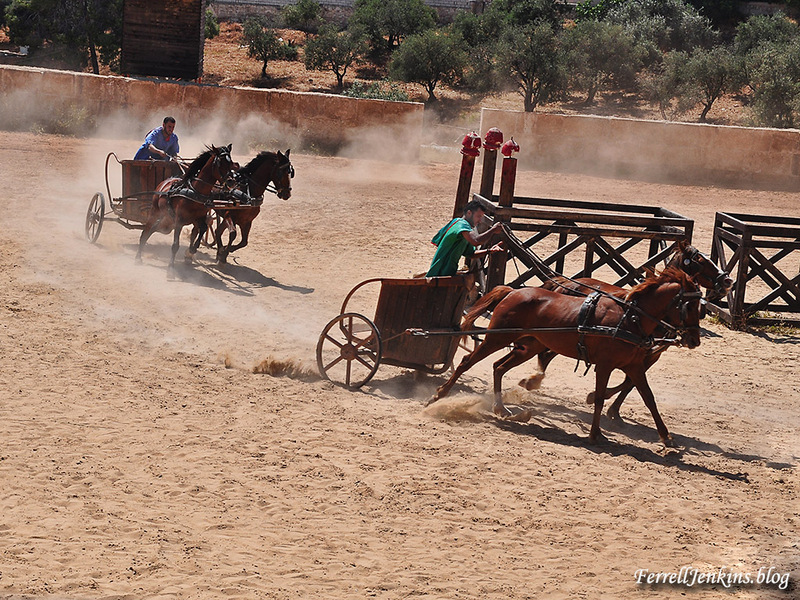 There we picked up a car and visited the sites of the seven churches of Revelation, and other biblical-related places, in western (or Aegean) Turkey. The photo below was made at Colossae. It was difficult to get to Colossae in those days, but we had come a long way and did not want to be denied. I had read an article by Dr. Harold Mare about a visit to the site and the wish that an excavation could be undertaken. We followed the dirt road to the bank of the Lycus River where this photo was made. Beyond the tell (huyuk, in Turkish) of Colossae is the snow covered Mount Cadmus. The city of Honaz is hidden from view by the mound. Melvin Curry and Ferrell Jenkins at Colossae in 1984. Photo by Phil Roberts. After our visit in Turkey we took a variety of boats to Samos, Patmos, Rhodes, and Crete. From there we took a flight back to Athens to complete our tour together. Melvin served as chair of Biblical Studies at Florida College prior to my stint. We see each other occasionally and enjoy a short visit now and then. Phil succumbed to pancreatic cancer at the young age of 57 in 2005. After Phil’s passing, Marty Pickup, a younger teacher at Florida College, and I prepared brief tributes to him. I am posting, for the first time, a link to these tributes at BibleWorld.com here. Former students and friends might enjoy reading these after a 10 year lapse. Marty died suddenly at the age of 53 in 2013. 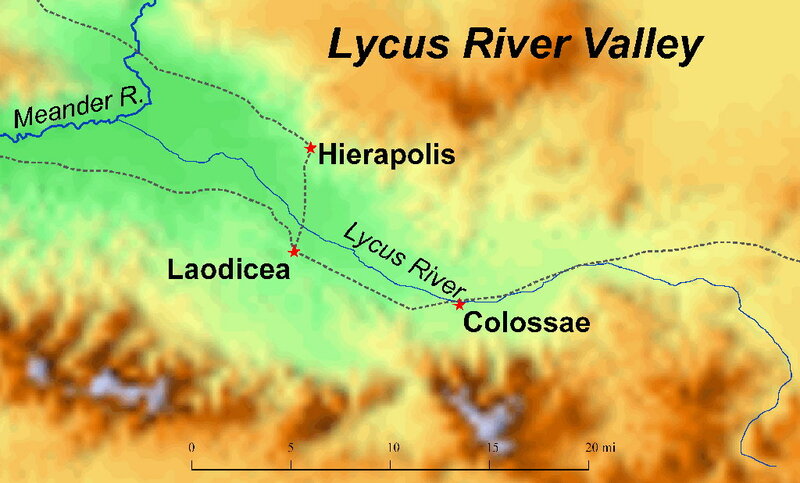 Three cities of the Lycus River valley are significant to New Testament studies. The saints at Colossae were the recipients of one of Paul’s epistles (Colossians 1:1-2). Hierapolis is mentioned in Colossians 4:13. Laodicea is mentioned in Colossians (2:1; 4:13-16), and was the recipient of one of the letters of the Book of Revelation (Revelation 1:11; 3:14). Cities of the Lycus River Valley. Made with Bible Mapper. That was a wonderful trip, and one of many such personal study trips I have been blessed to make in the Bible World. 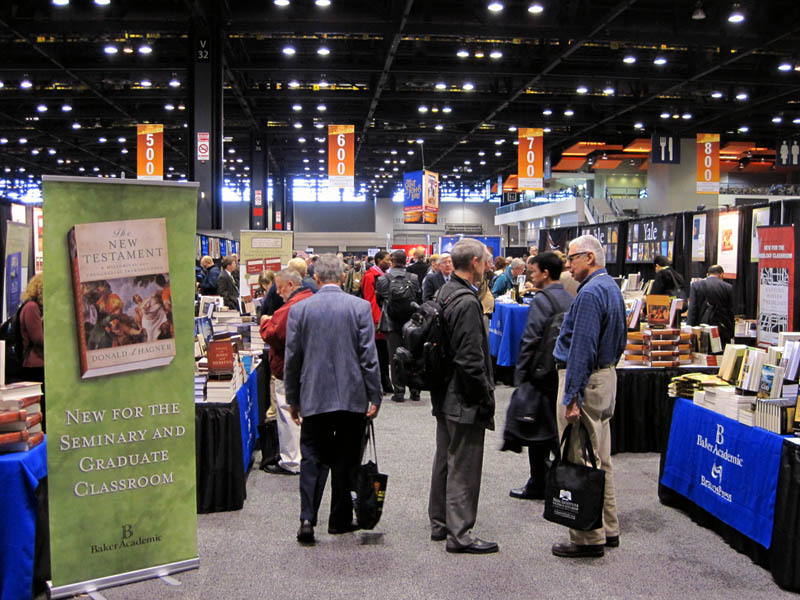 The annual meetings of the American Academy of Religion and the Society of Biblical Literature were held this year at the McCormick Place Convention Center in Chicago. I think McCormick Place is the largest facility of this type that I have ever been in. Much walking was required to move between sessions. Fortunately there is a good system of escalators to move between levels of the facility. With the two scholarly organizations meeting together the book exhibit is extremely large. It is impossible to show it all from floor level. Here is a little glimpse of the Baker Academic section. The AAR/SBL book exhibit, Chicago, 2012. Photo by Ferrell Jenkins. David McClister, my former student and colleague at Florida College, looks over one of the map books on display in the exhibit hall. 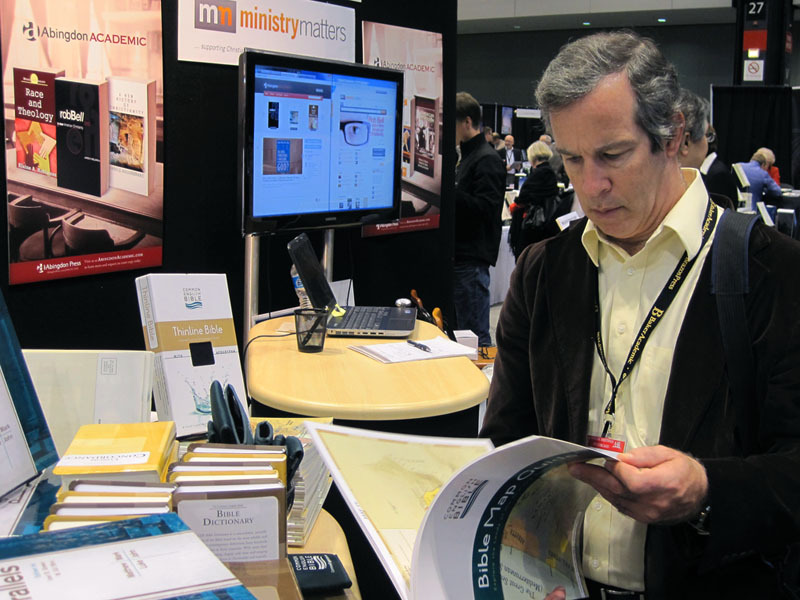 Dr. David McClister looks over a map book at AAR/SBL 2012. Photo by Ferrell Jenkins. I spent my time at the SBL sessions dealing with Places in the Bible World. I attended the session on Polis and Ekklesia: Investigations of Urban Christianity Consultation. The theme for the five speakers this year was Roman Corinth. The Biblical Lands and Peoples in Archaeology and Text Section covered a number of subjects including Moab, Ammon, the Philistines, first century priestly house in Jerusalem (Shimon Gibson), the possibility of a priestly order at Migdal-Gennesar (Richard Notley), et al. 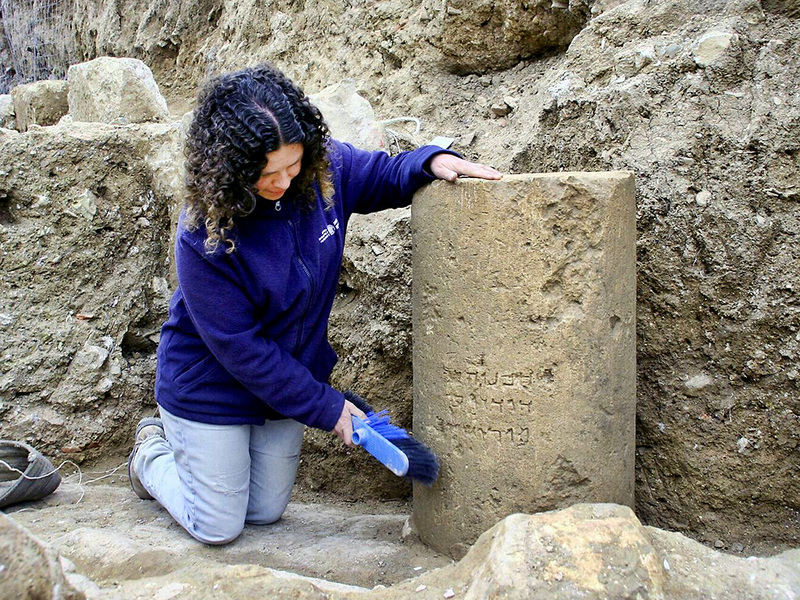 One session consisted of archaeological reports on the new excavations at Azekah (Oded Lipschits, Yuval Gadot), the ongoing work at Khirbet Qeiyafa (Michael Hasel, Yosef Garfinkel, and Madeleine Mumcuoglu), and the new work at Jezreel (Norma Franklin). Another session featured studies on the Egyptian invasion of the Sea Peoples (James Hoffmeier), Tell Tayinat (Tim Harrison), Tel Dor (Elizabeth Bloch-Smith), Ashkelon (Daniel Master), and Gath (Aren Maeir). There were a couple of other reports on the Philistines that I did not hear. It is always good to hear these reports first hand, long before the reports find their way into journals and books. 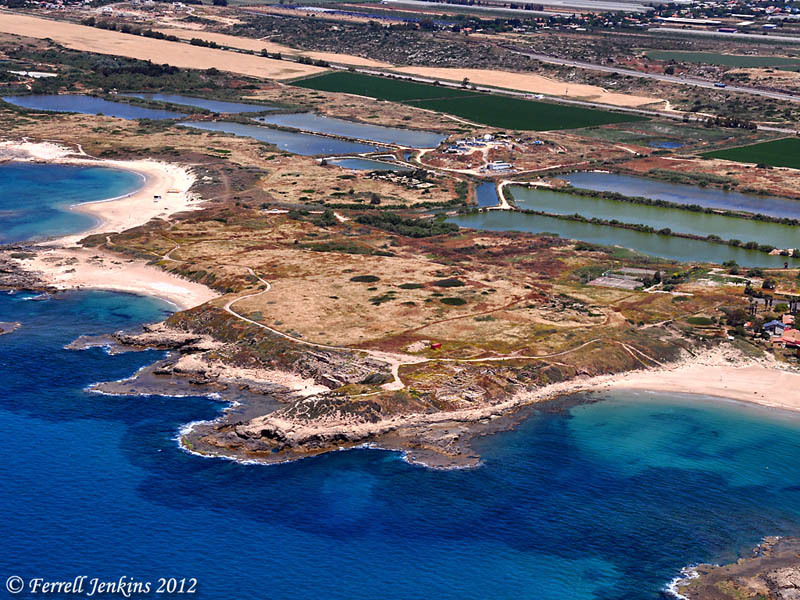 Aerial view of Tel Dor on the Mediterranean Coast. Photo by Ferrell Jenkins. 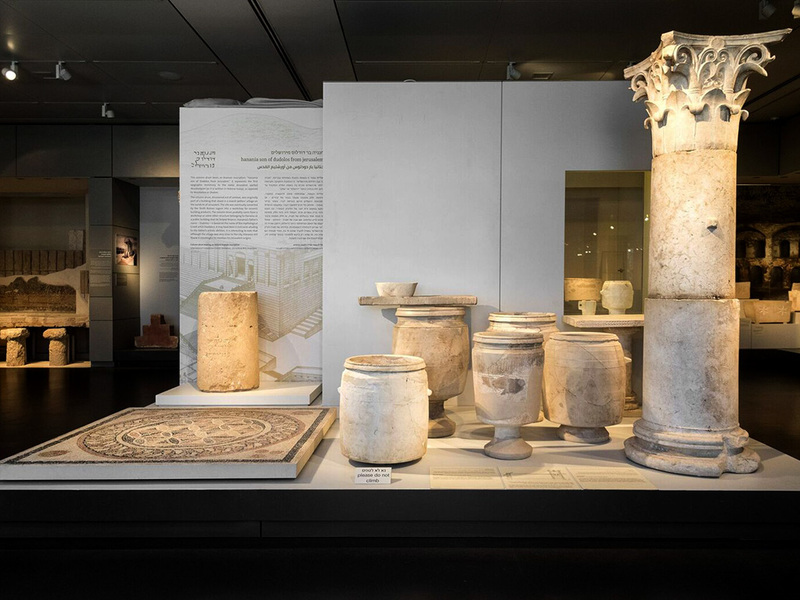 Dor has a long history extending from the Canaanite period around the 20th century B.C. It was also controlled by the Phoenicians, the Sea People, the Israelites, the Assyrians, the Babylonians, the Persians, the Greeks, and the Romans. 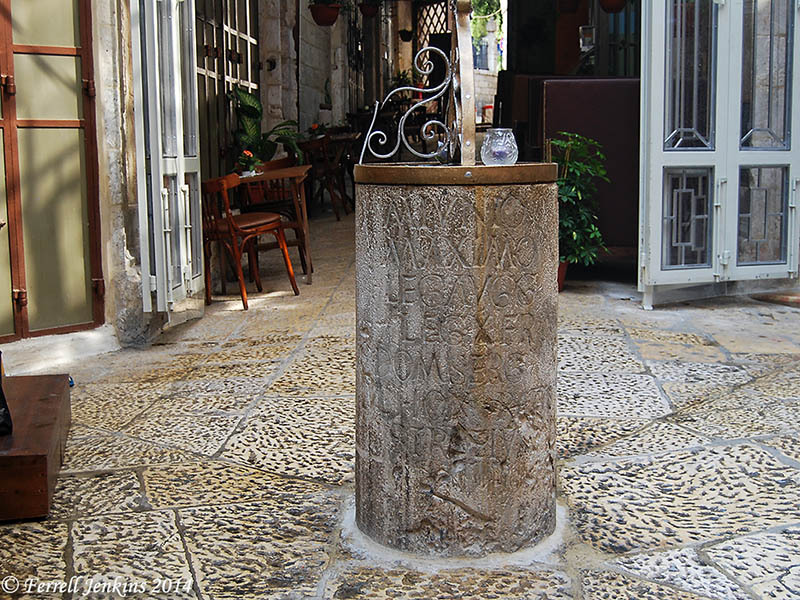 Dor was abandoned in the third century A.D. (Biblical Archaeology Review, Nov./Dec. 2002). For Biblical references to Dor, see here. It is nice to be back home with on time flights.